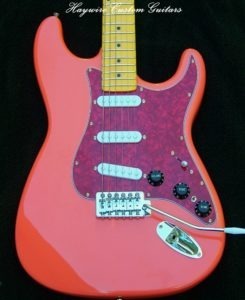 How to “Deck” Or Block A Tremolo On An Electric Guitar? Home/"Deck" Or Block A Tremolo, custom guitar by Haywire, Custom guitar modifications, Guitar adjustments, Guitar Education/How to “Deck” Or Block A Tremolo On An Electric Guitar? After playing a Guitar with a blocked or “decked” tremolo-you’ll love it! Why? Well simply put-if your not playing a guitar with an advanced system like the Floyd Rose Tremolo then chances are it’s the 70 year old Fender floating tremolo bridge technology your using. 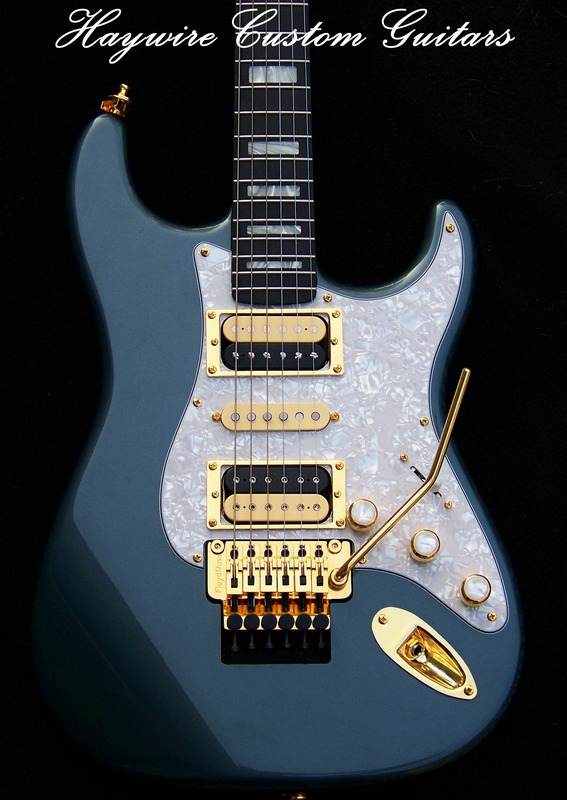 So, why will you love playing a guitar with a blocked trem? You’ll be in tune more of the time and no one in the band will give you a hard time anymore! All of our guitars at Haywire Custom Shop with standard 6 point tremolos are easily reversible hard tails. What do we mean by that? Well, simply put, they are all blocked tremolo style with the exception of the Floyd Rose models. Why does Haywire block the tremolo? 1- If all strings are removed at once it is time consuming to re-tune the guitar. 2- When one string breaks, all other strings go out of tune. 3- Intonation is a much longer and inaccurate process. 4- Because string bending can cause other strings to go slightly out of tune and sustain is lost. 5- Action with a “floating synchronized tremolo system” changes constantly and frustrates players. 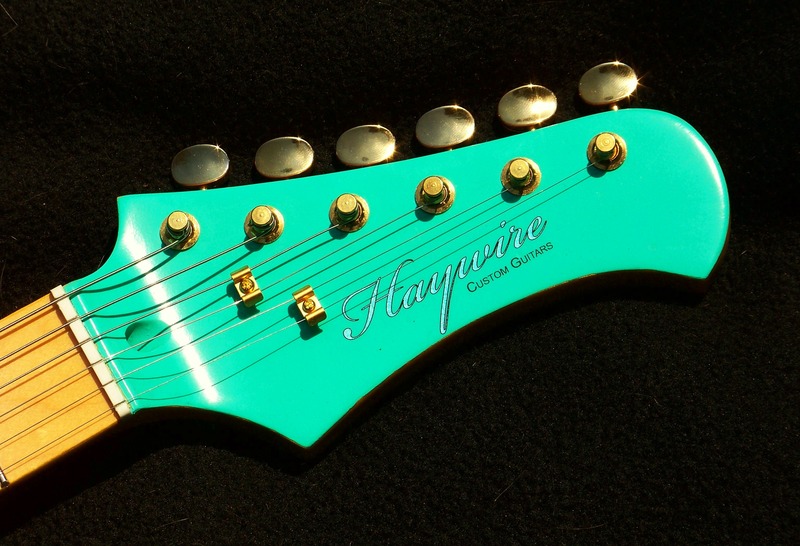 What is a blocked tremolo, how does Haywire accomplish it and why do it? A blocked tremolo requires tightening of the inertia block with the two tremolo claw screws at the back wall of the tremolo cavity to prevent it from moving. This makes the bridge behave more like a hard tail bridge, eliminating common headaches. Remember this unit design has not changed since 1948 but playing techniques have. Players are more aware of out of tune problems today because of much better electronic tuners that were not around back then. Fortunately this change does not modify the instrument, nor is it permanent. It can always be reversed, making it ideal for collectible instruments that need to stay original. The Strat bridge is blocked and basically tightened with the claw screws under the tremolo cover plate in the back of the guitar body. The springs are so tight that the tremolo will not move thereby rendering it a hard tail or a “blocked tremolo” or “decked tremolo”. Why not just use a hard tail bridge? Well two reasons: The re-sale value is much better if we don’t physically change anything. The decking can be reversed since lots of players still want a tremolo or whammy bar on their guitars. To reverse just loosen the 2 claw screws that have been tightened in the back under the tremolo cover. This will to put the tremolo back into service and have a usable tremolo system once again. Finally, there is a bit more added sustain with the tremolo bridge because it has a great deal more metal that a small hard tail bridge. It also has the benefit of the springs which add even more sustain….so…There you have it! My suggestion, if I may, Try a blocked tremolo for yourself and you’ll love it because it stays in perfect tune and the whole process is not permanent or invasive to your instrument and it’s completely reversible!